The 3 sinuses of Valsalva are located in the most proximal portion of the aorta, just above the cusps of the aortic valve. The sinuses correspond to the individual cusps of the aortic valve. These structures contained within the pericardium are easily revealed using aortography and echocardiography as distinct but subtle out-pouchings of the aortic wall just above the valve. The sinuses end in the area of the sinotubular junction, and the tubular portion of the aorta begins here. Aneurysm of a sinus of Valsalva is a rare congenital cardiac defect that can rupture, causing heart failure or other catastrophic cardiac events. If the aneurysm remains unruptured, it occasionally causes obstruction of cardiac flow resulting from compression of normal structures. Dissection of the aneurysm into the cardiac tissues may occur, causing obstruction or destruction of local structures. Acquired aneurysmal dilatation of the sinuses of Valsalva may occur because of Marfan syndrome, syphilitic aortitis, or as a function of aging. These entities are not discussed in this article. See the image below. Sinus of Valsalva aneurysm. 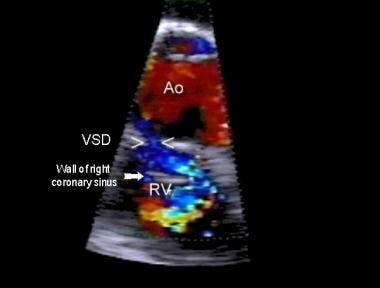 Color-flow Doppler ultrasonography is performed in the right ventricle through a supracristal ventricular septal defect with fingerlike prolapse of the right coronary sinus wall (arrow). Aneurysmal dilatation of the sinuses of Valsalva occurs when the aortic media is defective, allowing separation of the media from the aortic annulus fibrosus. The defect is inherited, but frank aneurysmal dilatation is rarely seen at birth. Sinus of Valsalva aneurysm is associated with a ventricular septal defect in approximately 40% of patients. Aneurysms typically develop as a discrete flaw in the aortic media within one of the sinuses of Valsalva. Aneurysms most often involve the right aortic sinus (67-85% of patients, often associated with a supracristal ventricular septal defect), followed by the noncoronary sinus, whereas an aneurysm of the left sinus is rare. Under the strain of aortic pressure, the sinus gradually weakens and dilates, causing the formation of an aneurysm. Lack of supporting tissue (eg, ventricular septal defect) may contribute to instability and progressive distortion of the aortic sinus, often with associated aortic insufficiency. Deficiency of the aortic media where it attaches to the aortic annulus produces dilation of the aortic sinuses, usually over many years. Distortion and prolapse of the sinus and aortic valve tissue can lead to progressive aortic valve insufficiency. Unruptured aneurysm may cause distortion and obstruction in the right ventricular outflow tract. Distortion and compression may also cause myocardial ischemia (by coronary artery compression) and, possibly, heart block (by compressing the conduction system). Rupture may occur into any chamber, although rupture most commonly occurs into the aortic right ventricular communication. Rupture into the right atrium is the second most common, in association with a noncoronary cusp aneurysm. Rupture may occur less commonly into the left-sided chambers,  the pulmonary artery,  and rarely extends into the pericardium. Sinus of Valsalva aneurysm comprises approximately 0.1-3.5% of all congenital cardiac anomalies. Discovery in the pediatric age group is unusual. Incidence in the Western Hemisphere (outside of the United States) is approximately the same as in the United States. An increase in prevalence is observed in Asians because of the higher incidence of supracristal (subpulmonic) ventricular septal defects. Major cardiac morbidity and late mortality in this condition also depend on the magnitude and location of shunts. In some instances, an unruptured aneurysm also causes major symptoms and hemodynamic alterations because of obstruction of valves or impingement upon cardiac structures (eg, coronary arteries, conduction system). The surgical mortality rate is estimated to be 5% or less. Increased incidence in the Asian population has been described, which is the result of increased incidence of supracristal ventricular septal defect in Asian persons. These ventricular defects may contribute to instability of the aortic sinuses, particularly the right aortic sinus. Average age of patients with rupture of a sinus of Valsalva aneurysm is approximately 30 years, with a range of 11-67 years in one series. Problems in infancy and childhood are uncommon. Ring WS. Congenital Heart Surgery Nomenclature and Database Project: aortic aneurysm, sinus of Valsalva aneurysm, and aortic dissection. Ann Thorac Surg. 2000 Apr. 69(4 Suppl):S147-63. [Medline]. Magee R. A Cardiac Clinico-Pathological Conference in 1882 an historical vignette. Heart Lung Circ. 2004 Sep. 13(3):322-5. [Medline]. Braunwald E, ed. Heart Disease: A Textbook of Cardiovascular Medicine. Philadelphia, PA: WB Saunders Co; 1996. Abad C. Congenital aneurysm of the sinus of Valsalva dissecting into the interventricular septum. Cardiovasc Surg. 1995 Oct. 3(5):563-4. [Medline]. Fazio G, Zito R, Dioco DD, Mussagy C, et al. Rupture of a left sinus of Valsalva aneurysm into the pulmonary artery. Eur J Echocardiogr. 2006 Jun. 7(3):230-2. [Medline]. Choudhary SK, Bhan A, Sharma R, et al. Sinus of Valsalva aneurysms: 20 years' experience. J Card Surg. 1997 Sep-Oct. 12(5):300-8. [Medline]. Dong C, Wu QY, Tang Y. Ruptured sinus of valsalva aneurysm: a Beijing experience. Ann Thorac Surg. 2002 Nov. 74(5):1621-4. [Medline]. Lin CY, Hong GJ, Lee KC, Tsai YT, Tsai CS. Ruptured congenital sinus of valsalva aneurysms. J Card Surg. 2004 Mar-Apr. 19(2):99-102. [Medline]. Perloff JK, Child JS. Congenital Heart Disease in Adults. 2nd ed. Philadelphia, PA: WB Saunders Co; 1997. Perloff JK. The Clinical Recognition of Congenital Heart Disease. 4th ed. Philadelphia, PA: WB Saunders Co; 1994. Pamulapati M, Teague S, Stelzer P, Thadani U. Successful surgical repair of a ruptured aneurysm of the sinus of Valsalva in early pregnancy. Ann Intern Med. 1991 Dec 1. 115(11):880-2. [Medline]. Thankavel PP, Lemler MS, Ramaciotti C. Unruptured sinus of valsalva aneurysm in a neonate with hypoplastic left heart syndrome: echocardiographic diagnosis and features. Echocardiography. 2014 Mar. 31(3):E85-7. [Medline]. Cho MS, Jang SJ, Sun BJ, Jang JY, Ahn JM, Kim DH, et al. Prognostic implications of initial echocardiographic findings in adolescents and adults with supracristal ventricular septal defects. J Am Soc Echocardiogr. 2014 Sep. 27(9):965-71. [Medline]. Tipoo Sultan FA, Basir N, Fatimi S. Aneurysm of sinus of Valsalva. J Coll Physicians Surg Pak. 2011 Mar. 21(3):173-5. [Medline]. Yacoub MH, Khan H, Stavri G, et al. Anatomic correction of the syndrome of prolapsing right coronary aortic cusp, dilatation of the sinus of Valsalva, and ventricular septal defect. J Thorac Cardiovasc Surg. 1997 Feb. 113(2):253-60; discussion 261. [Medline]. Zikri MA, Stewart RW, Cosgrove DM. Surgical correction for sinus of Valsalva aneurysm. J Cardiovasc Surg (Torino). 1999 Dec. 40(6):787-91. [Medline]. Stroeh K, Schreiber C, Henze R, Lange R. Surgical correction of a congenital coronary arterial fistula and a massive sinus of valsalva aneurysm. Interact Cardiovasc Thorac Surg. 2012 Aug 7. [Medline]. Kuriakose EM, Bhatla P, McElhinney DB. Comparison of reported outcomes with percutaneous versus surgical closure of ruptured sinus of Valsalva aneurysm. Am J Cardiol. 2015 Feb 1. 115(3):392-8. [Medline]. Cullen S, Somerville J, Redington A. Transcatheter closure of a ruptured aneurysm of the sinus of Valsalva. Br Heart J. 1994 May. 71(5):479-80. [Medline]. Abidin N, Clarke B, Khattar RS. Percutaneous closure of ruptured sinus of Valsalva aneurysm using an Amplatzer occluder device. Heart. 2005 Feb. 91(2):244. [Medline]. Arora R, Trehan V, Rangasetty UM. Transcatheter closure of ruptured sinus of valsalva aneurysm. J Interv Cardiol. 2004 Feb. 17(1):53-8. [Medline]. Jean WH, Kang TJ, Liu CM, et al. Transcatheter occlusion of ruptured sinus of Valsalva aneurysm guided by three-dimensional transesophageal echocardiography. J Formos Med Assoc. 2004 Dec. 103(12):948-51. [Medline]. Rao PS, Bromberg BI, Jureidini SB, Fiore AC. Transcatheter occlusion of ruptured sinus of valsalva aneurysm: innovative use of available technology. Catheter Cardiovasc Interv. 2003 Jan. 58(1):130-4. [Medline]. Narin N, Ozyurt A, Baykan A, Uzüm K. Transcatheter closure of ruptured sinus Valsalva aneurysm with retrograde approach. Turk Kardiyol Dern Ars. 2014 Apr. 42(3):299-301. [Medline]. Shaddy RE, Tani LY, Gidding SS, et al. Beta-blocker treatment of dilated cardiomyopathy with congestive heart failure in children: a multi-institutional experience. J Heart Lung Transplant. 1999 Mar. 18(3):269-74. [Medline]. McMahon CJ, Ayres N, Pignatelli RH, et al. Echocardiographic presentations of endocarditis, and risk factors for rupture of a sinus of Valsalva in childhood. Cardiol Young. 2003 Apr. 13(2):168-72. [Medline]. El Hattaoui M, Charei N, Boumzebra D, Chraibi S, Bennis A. A large aneurysm of a left sinus of Valsalva invading the interventricular septum--a rare cause of syncope. Can J Cardiol. 2008 May. 24(5):e28-9. [Medline]. Takach TJ, Reul GJ, Duncan JM, et al. Sinus of Valsalva aneurysm or fistula: management and outcome. Ann Thorac Surg. 1999 Nov. 68(5):1573-7. [Medline]. Li ZQ, Liu AJ, Li XF, Zhu YB, Liu YL. Progression of aortic regurgitation in Asian patients with congenital sinus of valsalva aneurysm. Heart Surg Forum. 2013 Aug 1. 16(4):E219-24. [Medline]. Bricker AO, Avutu B, Mohammed TL, Williamson EE, Syed IS, Julsrud PR, et al. Valsalva sinus aneurysms: findings at CT and MR imaging. Radiographics. 2010 Jan-Feb. 30(1):99-110. [Medline].